Stamp Duty Exemption applications can be made by First Time Home Owners, for stamp duty exemptions on their conveyance and mortgage instruments, relative to the acquisition of their first time dwelling home. Must be a first-time homeowner. The structure must be a single family dwelling house, duplex, but portion must be owner occupied or a condominium unit. The value of the structure and property must be under $500,000. Complete the relevant application forms online. Print and sign where required. A recent appraisal report for your home. Copy of your National Insurance Card and relevant pages of passport. Copy of the first, signature and backing pages of Conveyance and/or Mortgage Instruments. Any other document and/or information that may be requested by the Stamp Exemption Unit. There is no tax associated with this service. 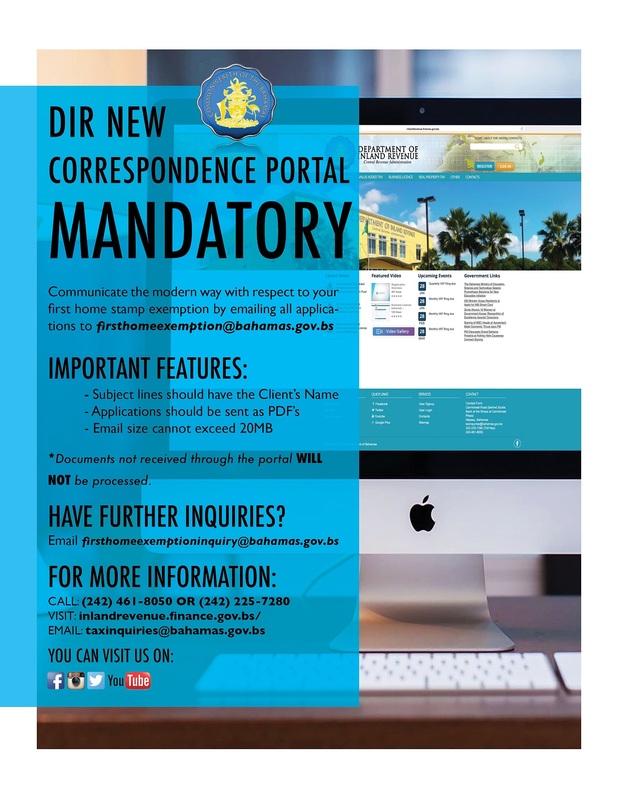 For more information please contact the Department of Inland Revenue by emailing taxinquiries@bahamas.gov.bs , calling toll free (242) 225-7280 or 461-8050.